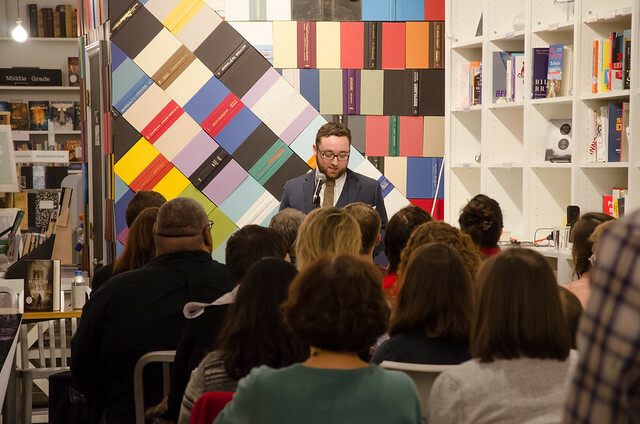 Thanks to the 100+ people who joined us last night at Volumes Bookcafe for the first annual Chicago Review of Books Award Ceremony. It was an inspiring to see the strength and diversity of Chicago’s literary community in the face of so much uncertainty in 2016. If you missed our (imperfect) Facebook Live stream, you can still watch 3 of the 4 panels and award announcements here (skip ahead to the 19:36 mark or so, and we apologize for the occasional poor quality). There’s also an album of gorgeous photos embedded below, thanks to Paul Callan. We were thrilled as well by the number of small and independent presses represented at the ceremony, including Chicago’s own Curbside Splendor, Haymarket Books, and Chicago Review Press, as well as Melville House, Restless Books, Tree Light Books, Counterpoint Press, Alice James Books, Tor Books, and Bloomsbury USA. While we truly believe every finalist in fiction, nonfiction, poetry, and debut deserved to win, here are the 4 books and authors who took home an award. Natalie Y. Moore grew up in the Chatham neighborhood on the South Side of Chicago. Today, she lives in Hyde Park and serves as WBEZ Chicago‘s South Side Bureau reporter. The South Side: A Portrait of Chicago and American Segregation is a fascinating mix of memoir and reportage that challenges the prevailing notion that half of Chicago is a war zone. Further, Moore shows how today’s socio-economic realities on the South Side—where the unemployed often stay unemployed, the working class often stays working-class, and the middle and upper-middle class face challenges unknown to the North Side—are the direct results of racist housing and banking policies, retail redlining, food deserts, public school failures, and misrepresentations in the media. Abigail Zimmer is the poetry editor at The Lettered Street Press and the author of two additional chapbooks. A reimagining of the Ugly Duckling fable, child in a winter house brightening is a hybird long poem that offers a glimpse—sometimes gentle, sometimes haunting—at the not-quite-natural world in a singular, ghostlike voice. Our sister publication, Arcturus magazine, published an excerpt from child in a winter house brightening last month.